Park City is considered one of the best mountain resort towns in North America, which is why it's both a playground for the rich and famous as well as a great destination for families and groups of friends. No matter when you decide to experience the beauty and excitement of Park City in person, you should work with Vacatia to book your stay at one of the best luxury resorts in Park City. This idyllic mountain town is home to a number of luxury resorts, and you could experience this luxury for yourself when you rely on Vacatia to book your accommodations. When you stay in a luxury resort in Park City, you will be able to enjoy every moment of your time in this beautiful mountain resort town. Whether you visit Park City during the warm summer months or during the cooler winter months, you will be able to elevate the overall quality of your vacation by staying at one of Vacatia's luxury rental properties. Park City boasts some of the best skiing in the country, but it also features great hiking trails and golf courses during the warmer seasons. 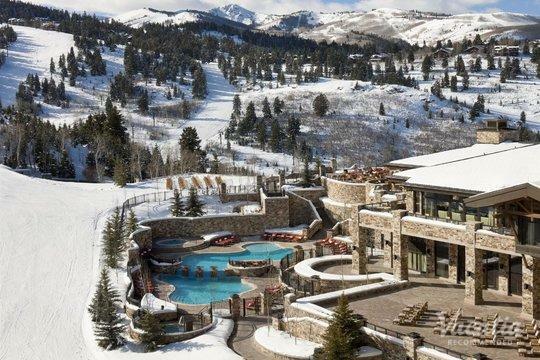 Whether you're heading to Park City to indulge in great skiing or great hiking, you should work with Vacatia to book your stay at one of the best 5 star resort hotels Park City has to offer. When you stay at a Vacatia rental property, you can rest assured that you'll be able to enjoy ample space and comfort in your resort residence. Vacatia's rental properties feature the living space and comforts of a home, which means you'll be able to whip up breakfast in your fully equipped kitchen before hitting the slopes. Not only does Vacatia's rentals boast extra space and comfort, but they also feature the desirable services of a luxury resort. So if you want to experience the perfect combination of luxury and comfort, be sure to book your Park City accommodations through Vacatia. Park City is a beautiful town nestled in the Wasatch Mountains of Utah. A mere 32 miles from Salt Lake City's airport, Park City is easily accessible for visitors year-round. During ski season, visitors flock to Park City to indulge in the world-class skiing of Park City Mountain Resort and Deer Valley Resort. As the home of Utah Olympic Park, Park City is famed for its exceptional snow sports and ski slopes. However, this charming mountain destination isn't only popular during the winter months, because Park City also boasts plenty to do and see during the warmer seasons. As a popular winter destination, Park City is known for great hiking, mountain biking, and golfing. No matter when you visit this idyllic town, you are sure to find something to keep you entertained and excited from the moment you arrive until the moment you leave. So if you want to add a bit of luxury to your Park City getaway in addition to excitement and adventure, be sure to book your accommodations through Vacatia.